This image appears on a legal complaint by law firm Kline & Specter, filed yesterday on behalf of several passengers injured in the Amtrak 188 derailment: USDC Eastern District 15-CV- 2744-LDD. The oil trains, carried by a company called Conrail, transport the oil, from a North Dakota shale formation, through Chicago to Philadelphia, according to a Conrail spokesperson and industry documents reviewed by The Spirit. The oil trains initially enter the Riverwards in Kensington along a line owned by Amtrak before branching off through Port Richmond near Bridesburg to cross the Delaware River. The freight then travels from Philadelphia across the Delaware River to South Jersey refineries. Conrail is a wholly owned subsidiary of CSX and Norfolk Southern, “two larger rail lines”. Though, according to a CSX spokesperson, the company operates independently. The federal government created Conrail in the 1970s to help bail out bankrupt rail companies. Though Conrail was privatized in the 1980s, it continues to receive federal funding today. The company has since been involved with several notable environmental issues. A federal court convicted Conrail of multiple felony counts of environmental crime in 1995. The firm currently faces multiple lawsuits over a 2012 incident in Paulsboro, NJ, where a Conrail freight train derailed over a bridge in November of that year and released about 24,000 gallons of vinyl chloride, according to a National Transportation Safety Board accident report. While a Conrail official has confirmed that the tankers near the Amtrak 188 derailment did not contain crude oil, and were in fact empty, what if they hadn’t been? The Spirit’s analysis of the derailment suggest that had the passenger train hit nearby oil tankers, around 15,696 people from the area, including parts of Port Richmond, may have fallen within the evacuation zone: a half-mile radius around the crash site. This figure represents the total population in 12 Census block groups surrounding the crash site. The Philadelphia Office of Emergency Management did not respond to a request for comment. However, as City Paper has reported, the office’s director during a public meeting speculated that if an incident involving crude oil did occur, the evacuation zone would be a half-mile radius. Furthermore, a recent report from PennEnvironment indicated that the same radius was put into place in other crude oil disasters. A Conrail representative did not respond to a request for comment about their safety operations. 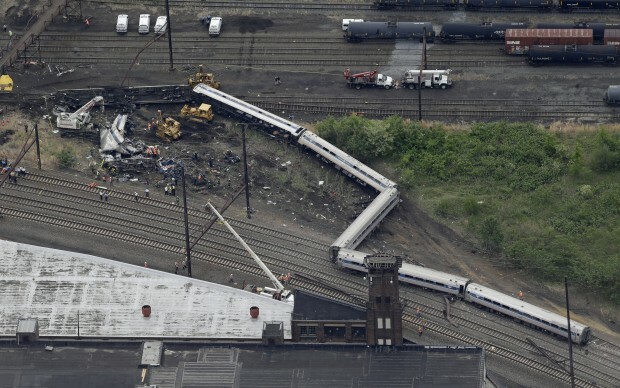 The Spirit’s investigation of Conrail’s operations began before the recent Amtrak derailment, and relied upon industry documents provided to the Pennsylvania Emergency Management Agency under a federal Department of Transportation order. The Pennsylvania Office of Open Records then mandated their public release. Subsequent changes to the laws have rendered these records once again inaccessible. There have been several other documented instances of close calls regarding oil tankers in Philadelphia. A derailment left train cars dangling over the Schuylkill River in January 2014, and another train ran off its tracks in South Philadelphia a year later. An April 2014 story in The Inquirer details a third incident, which involved Conrail tankers in Port Richmond on the train tracks crossing Aramingo Avenue near Castor Avenue, close to where Amtrak 188 derailed last week. Conrail spokesman John Enright told the Inquirer that three tanker cars of the nine-car train derailed in the 2014 Port Richmond incident. The cause of that derailment wasn’t known at the time. According to Conrail, the tankers were carrying acetone. The Philadelphia Fire Department found no leaks in the crash and no injuries were reported. These scenarios aren’t unique to Philadelphia either. Two years ago, a runaway oil train in Lac-Mégantic, a town in Quebec, hit a nightclub and killed 47 people. Other instances in West Virginia, North Dakota, and Illinois had oil tankers catching fire in more rural area. Philadelphia’s oil lines run through highly residential areas: University City, Southwest Philadelphia, and North Philadelphia. As maps show, if an emergency involving an oil spill were to occur, evacuating the area would be a huge undertaking and potentially result in mass casualties. The Inquirer estimates that 400,000 total Philadelphians live within a half-mile of rail lines that carry crude oil. Some in Philadelphia have called for the creation of an “Energy Hub” in the city, especially Phil Rinaldi, CEO of Philadelphia Energy Solutions (PES), the company that owns a South Philadelphia crude oil refinery. This plan would make a Philadelphia a pipeline center for crude oil, natural gas and other gas liquids. The creation of a Philadelphia Energy Hub would greatly benefit the city’s manufacturing industry—an industry that’s been crippled since the deindustrialization of the city in the 50s—but also brings up a host of safety concerns. City representatives maintain that Philadelphia has a comprehensive emergency protocol in place to respond to a disaster involving crude oil or any other hazardous materials. Some of the information, such as evacuation routes, is available on the city’s website. City officials, however, have refused to disclose information regarding the specifics of this plan to clean water activists, who believe the city has no such formalized plan. “That’s one of our challenges—striking the balance between sharing information so the public can be prepared and not sharing information because we do live in this post-9/11 world,” Samantha Phillips, the city’s director of emergency management, told The Inquirer. NBC10.com – Daralene Jones – A Conrail train jumped a track in the Port Richmond section of the city. A freight train hauling hazardous materials derailed this morning at a Philadelphia signal crossing causing a major road to be closed for hours. Two rail cars went off the tracks blocking Aramingo Avenue between Castor Avenue and E Butler Street in the Port Richmond section of the city around 3:15 a.m. The derailed cars remained blocking the road for hours before they were lifted out of place, the track was repaired and the road was reopened. The rail crossing in the industrial/commercial area flashed and bells rang for some time as the derailed nine-car freight train remained in the middle of the road near a ShopRite store for hours. There were no injuries and luckily none of the tanker cars overturned or leaked. A Conrail spokesman said that it appeared that the tanker cars jumped the rail and landed in the mud after the actual rail cracked. NBC10 cameras captured the cracked rail. The spokesman said that the tanker cars were hauling flammable liquids including acetone in two cars and phenol in the rest. Acetone is a common industrial solvent that is harmful if swallowed or inhaled. Conrail said nothing leaked during the accident and there was no immediate threat to neighbors in the area. Motorists were urged to avoid the area if at all possible as the cleanup continued. NBC10’s Jillian Mele suggested taking Frankford Avenue or Richmond Street to avoid Aramingo Avenue. She warned however to expect heavier volume on nearby roads. The seven cars that remained on the tracks were detached from the derailed cars around 6 a.m. It isn’t clear when the remaining derailed cars will be cleared. Heavy equipment was brought in to remove the cars. The rail cars were removed just before 9 a.m. but the road remained closed as crews worked to repair the track. About 30 minutes later the road reopened to traffic. Conrail crews remained on the scene investigating and making further repairs. The track was inspected within the last month, a federal requirement. Conrail is owned by Norfolk Southern and CSX, the railroad company that was under scrutiny last month by city council for its safety and maintenance practices. Another recent train derailment in Philadelphia prompted Johnson to hold hearings about railroad safety in which officials with CSX testified. The Federal Railroad Administration provided NBC10 reports which showed that Conrail was involved in 17 accidents last year, a 55% increase over 2012. The data also shows eight accidents caused by tracks and 14 total derailments, up 39% from 2012. A train derails on Aramingo Avenue causing a road block. The train was carrying flammable chemicals and appeared to derail after hitting a crack in the track.